Previous Page Contact Phil if you have further questions: phil_hannay@kaphian.com or 612-308-2664. 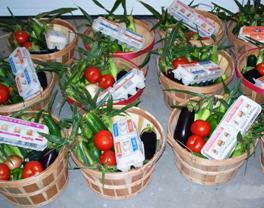 CSA provides an upfront commitment to a local farm for produce sales week after week during the season. This is huge from a small business perspective. We can make purchases of seed and equipment without the expense and risk of a bank loan. More importantly, we know our budget, so we can hire employees and commit to giving them work all season long. Last year, in addition to myself and my wife; we had our son working year-round, and 3 students working during the summer. Some years ago, the 2011 season started poorly with cold and continued rain for 6 weeks. Our CSA customers allowed us to keep our employment commitments, keeping our workers busy with other projects, knowing that eventually the rain and cold would end and we could get to work growing food. Without CSA, and no income coming in, I would have had to cut their hours significantly, or worse, laid them off until July. We offer EXTRAS other farms don’t have like asparagus and berries, plus our free range eggs. You get PRIORITY for produce, like asparagus, eggs and other items that run short at a farmers market. We include FREE Home Delivery - right to your door. ZERO LANDFILL - we take back all of the packaging we give you, either re-using it, recycling it, or composting it. Nothing goes to the landfill. You Don't! We include FREE Home Delivery. Your box will be delivered to your doorstep. We use an insulated box with icepak to keep your items cool. What is the “Northwest Metro” home delivery area? In general, from Buffalo, we go North to the Mississippi River, East to US-169, South to I-394/US-12 and West to Delano, Montrose and Maple Lake. Towns included are Buffalo, Monticello, Albertville, Otsego, St Michael, Rogers, Dayton, Champlin, Maple Grove, Plymouth, Wayzata, Medina, Hanover, Rockford, Maple Plain, Delano, Montrose and Maple Lake. Once in a while, you will not want your share – maybe you are on vacation, or just not able to cook that week. It’s not a big deal. You can "hold" your share and then choose to receive a "double box" the next week, or you can also donate your share to the food shelf. You can also receive a credit on your account if you want to do a "vacation hold" for multiple weeks. We are not certified organic. However, we keep things simple and use only normal things you’d find at a garden store. We rotate fields and incorporate cover crops. We do use some fertilizer when transplanting, and a few crops like onions and sweet corn like some extra nitrogen. Typically, a balanced fertilizer like 10-10-10 for transplanting, and a high nitrogen lawn fertilizer like 26-0-5 (without phosphorus or any herbicides) for corn or onions. Chicken manure is composted along with straw, wood chips and packaging that you return to us, and then added to the fields. As we harvest produce for you to eat, we are removing from our fields the organic material and nutrients that went into our produce. That must be replaced for the next crops to grow as nicely. So we do EXTENSIVE COVER CROPS to add organic matter to the soil and provide food for a flourishing underground world of earthworms and microbes. When the cover crops are growing actively with lots of root development, we will do a light fertilization with a balanced 17-17-17 fertilier. The cover crops soak this up like a sponge with no runoff or leaching. Those nutrients, plus other micronutrients, are pulled from the soil and will be slowly released as the earthworms and microbes decompose the disked in cover crops, making these nutrients available to our vegetable crops. We NEVER apply fertilizer (or compost for that matter) to bare soil or dormant (winter) fields. This is how nitrogen and phosphorus leach out and end up in our lakes, rivers and water supply. We only apply compost and fertilizer when plants are actively growing with fully developed roots that will soak up the nutrients the moment they become available. We ALWAYS fertilize in small doses so plants can fully utilize the nutrients without any waste. Once in a while we use a herbicide or a pesticide. We will use Roundup herbicide on tough spreading weeds like thistle and quack grass. Despite its bad press, it's actually a very environmentally friendly herbicide because it binds tightly to the soil so it can’t get into the water table, and it decomposes in a few days. We can't keep it in a tank for long as it will "spoil" just like milk - the bacteria and mold eat it up. Obviously it is not used on our crops as it would kill them. The only exception is sweet corn. We have grown a few varieties of roundup ready sweet corn. We do not normally use pesticides. We prefer to tolerate insect pests – figuring that they are kept in balance by beneficial insects. Once in a while, the damaging insects get out of control (potato bugs or cabbage worms) and we will use an organic pesticide like BT or Spinosad to help control them. Spinosad, while organic, is still an broad-spectrum insecticide and thus lethal to bees, so we never use it when a plant is flowering. Yes indeed. Not only bee friendly, but insect friendly! We rarely use pesticides, preferring to keep things balanced. Bees, of course, love farms like ours. Many flowers, varied plants, and things flowering all year until frost. Its fun to watch the squash blossoms to see all the different types of bees. We see honeybees, of course, but also many types of wild bees like bumblebees and the many small bees that most people don't know exist. Even bees that only like squash blossoms. We also have unplanted areas (steeper hills, wind breaks) that have wild flowers like yarrow, golden rod and sumac, plus two sections of prairie with coneflowers and lupine. Two years ago, we built a dam to help slow down water flow in a gully. In the wall, we added rocks, plus wool mulch and landscape fabric. Why? For field mice and voles to build nests, which then become the preferred nesting spots for bumblebees in subsequent years. Butterflies, also like this same habitat, and we encourage milkweed patches for Monarch butterflies. And wasps, despite their bad press, are also welcome. Think of them as flying carnivores (just like dragonflies), but going after caterpillars like cabbage worms. They love the juicy caterpillars for feeding their babies. So we do not disturb yellow jacket and other paper wasp nests whereever possible. Are your chickens free range? What do they eat? Yes. During the daytime, our chickens are free to roam a fenced in area (about 3 acres of grass and woods) where they can eat grass and scratch for bugs and seeds. At night, they sleep in our barn with the door closed to protect them from predators (raccoons, foxes or wandering dogs – It’s a jungle out there). The chickens eat a commercial vegetarian layer feed plus all of the kitchen and garden scraps. They really like lettuce, strawberries and summer squash! We also have two portable chicken coops each holding 50 hens each. They are moved around in our field as needed to provide extended range for the hens. In fact, they will be put to work, removing grass and weeds from some of our plantings. What if I just want eggs? We offer an “Egg Only” CSA option as well for those customers that want a steady supply of eggs through the entire season. You can get extra eggs if you are running short one week, or defer delivery if you have plenty of eggs. If you find yourself always running out of eggs, you can adjust your amount to 1.5 shares, or 2 shares as needed. What’s special about your farm or produce? The produce we deliver is planted, grown and harvested on our farm to insure the best quality. This is YOUR FARM - you can visit it, wander around and see how we grow your food. We are not a consolidator, gathering produce from different growers and delivering to you as a middleman. If you have a question, we know the answer since we planted it, grew it and harvested it. Occasionally, we may add some special items grown by a neighbor, one of our employees, or even a member. Last year we had some older varieties of sweet corn from one of our fellow market people. And we had some lettuce and squash from one of our employees! We start receiving seed catalogues in December and scrutinize new varieties carefully. Sometimes we try something new and sometimes we go back to the “tried and true”. We look for what tastes the best and is the most disease resistant. We invite your feedback, good or bad. YES! After all, its YOUR FARM! Someone is always around Monday thru Friday, 9AM-3PM. Just drop by. If you want to come at another time, give us a call at 612-308-2664 before you come so you know we are home. A self-guided tour is available. There are several nice spots in our pastures or along the marsh for a picnic. If you decide to become a member, you aren’t required to work at our farm (unless you really want to!). Typically, for products that are plentiful, everyone gets some. New arriving products like strawberries maybe split into smaller portions just to make sure everyone gets the “first taste of the season”. We also have our Box Customizer. Each week, you can go online, and pick your favorites from the "optional" items (like which type of potato, maybe cabbage or bok choi, or your favorite summer squash). This system will also allow you to add "extras" to your box like a desired herb or some items that we have surplus. One goal is to provide each item we grow to everyone at least one week during the season, so you can try something you might not normally buy like turnips or edamame soybeans. Another goal is to make available basic items like herbs, onions, potatoes and beans for as long possible as “optional” or "extra" items. How much is a typical Full Share or Half Share? During the peak season, a full share will be about a bushel of produce. (A large apple box is a bushel). Obviously, in the beginning, the amounts are smaller as things are just starting. However, our asparagus starts mid-May, and we typically start early crops like lettuce, spinach, green onions and radishes in a hoop house so we get those products in May as well. In general, figure a full share is good for a family of 4 (or 2 vegetarians), and a half share is good for 2 people. We try to keep the shares reasonably sized so you are not getting too much of any one thing. Another way to look at it - for the summer season, a share comes to about $30 per week. Now go to the grocery store and buy $30 worth of mixed produce (leaf lettuce, summer squash, snap peas or green beans, tomatoes, peppers, raspberries) and see what it looks like. Our share will be similar - but of course - fresher and tastier! As you know, with CSA you share some of the risk of farming. If we have good planting and growing conditions, your share of the harvest will be more plentiful and varied. However, in a bad year, the yield and variety will be reduced. To give you an idea of how this might vary, here are examples of some of our baskets in 2009 (a good year) and 2011 (our worst year in the 12 years we have been farming). These are a typical “full share” for a week during that month. For “half share”, figure half of the amount. “Picks” are where you pick items you want to add to your basket from our collection of whatever else there is available that week. In a bad year like 2011, there were few “picks” since we had no surpluses of anything.